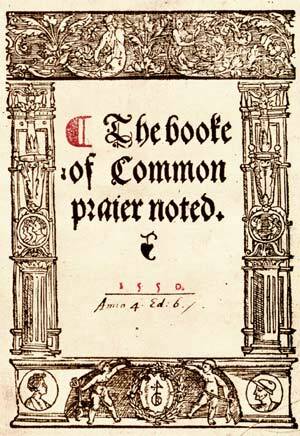 The Book of Common Prayer, as is the case with the Authorized (King James) Version of the Bible, represents one of the major works of English literature. The BCP has been profoundly influential in transforming not only the culture and religion of the English-speaking peoples but the English language itself. Not only are our rites of corporate worship and private devotion found in the pages of the BCP, but also our core beliefs. Lex orandi, lex credendi. As proper prayer and worship shape proper theology, what could be more appropriate than offering God’s word written back to Him in praise and thanksgiving? (Certainly not our spontaneous and individualistic utterances.) Known as “The Bible arranged for worship,” the classic BCP’s text is taken mostly from direct quotations of Holy Scripture (87% to be exact), and much of the remainder is paraphrased Scriptural passages. By saying the Daily Offices and offering the Holy Eucharist weekly over the course of a year, most all of the Old Testament can be read, much of the New Testament can be traversed more than once and the Psalms can be read and prayed up to twelve times. Truly, the BCP offers not only the opportunity to celebrate Christmas & Easter but the whole of Christ’s earthly life and ministry and the history of Almighty God’s plan of salvation for us each and every year. 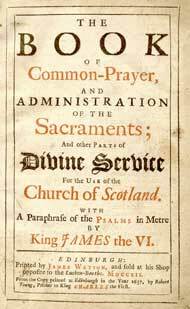 The 1637 Scottish BCP was very influential in the development of our own. Many, including an unfortunate number who profess to be Christians, ask why Eucharistic prayers have to be liturgical and so “complicated” when Jesus supposedly made it so simple in the Upper Room. Such protests unfortunately reveal a misunderstanding of what actually happened when our Savior instituted the Sacrament of Holy Communion. He did not recite the prayers extemporaneously, impulsively—in a vacuum—but they rather represented a well known act known as Berakoth, where God was blessed for gifts of mercy and deliverance in the past and was begged for that same saving action in the present. Beyond the liturgy, the meal itself unfolded to a definite ritual pattern. Bread and wine were blessed at prescribed moments and only certain persons could be present for the final solemn prayer. On Sunday, all who live in the city or countryside assemble. The memoirs of the Apostles and the writing of the Prophets are read. When the Lector has finished, the Priest addresses us, admonishing us and exhorting us to imitate the splendid things we have heard. Then we all stand and pray, and… bread, wine and water are brought up. The priest offers prayers of thanksgiving… the gifts over which thanksgiving has been spoken are distributed and each one shares in them… The reason why we all assemble on Sunday is that it is the first day, the day on which God transformed darkness and matter and created the world and the day on which Jesus Christ our Savior rose from the dead. These words will sound very familiar to Prayer Book worshipers, and indeed, to all Western Catholic Christians. 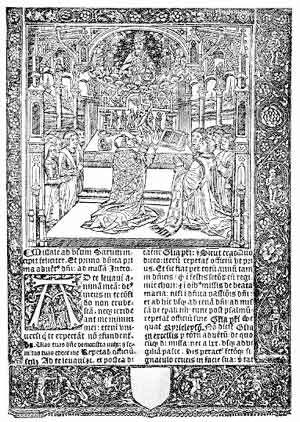 The Prayer Book as it stands is a long gallery of Ecclesiastical History, which, to be understood and enjoyed thoroughly, absolutely compels a knowledge of the greatest events and names of all periods of the Christian Church. To Ambrose we owe the present form of our Te Deum; Charlemagne breaks the silence of our Ordination prayers by the Veni Creator Spiritus. The Persecutions have given us one creed, and the Empire another. The name of the first great Patriarch of the Byzantine Church closes our daily service; the Litany is the bequest of the first great Patriarch of the Latin Church, amidst the terrors of the Roman pestilence. 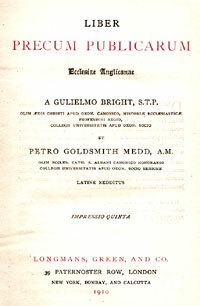 Our collects are the joint productions of the Fathers, the Popes (East & West), and the Reformers… The more comprehensive, the more free, the more impartial, is our study of any or every branch of Ecclesiastical History, the more will it be in accordance with the spirit and with the letter of the Church of England. 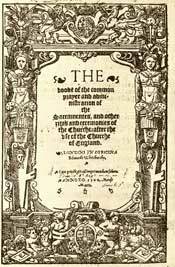 And thus, in accordance with the spirit and letter of the Book of Common Prayer. The 1928 BCP is our standard for worship & prayer. 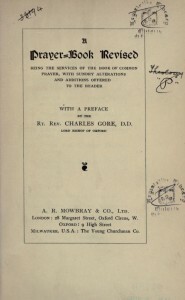 Percy Dearmer’s “A Prayer Book Revised” of 1913.